charAt(n): Returns the character at the specified index in a string. The index starts from 0.
charCodeAt(n): Returns the Unicode of the character at the specified index in a string. The index starts from 0.
concat(string1, string2, .., stringX): The concat() method is used to join two or more strings. This method does not change the existing strings, but returns a new string containing the text of the joined strings. //Output will be "jQuery By Example!" fromCharCode(n1, n2, ..., nX): Converts Unicode values into characters. This is a static method of the String object, and the syntax is always String.fromCharCode(). indexOf(searchvalue, [start]): Returns the position of the first occurrence of a specified value in a string. This method returns -1 if the value to search for never occurs. This method is case sensitive! lastIndexOf(searchvalue, [start]): Returns the position of the last occurrence of a specified value in a string. The string is searched from the end to the beginning, but returns the index starting at the beginning, at postion 0. Returns -1 if the value to search for never occurs. This method is case sensitive! substr(start, [length]): The substr() method extracts parts of a string, beginning at the character at the specified posistion, and returns the specified number of characters. substring(from, [to]): The substring() method extracts the characters from a string, between two specified indices, and returns the new sub string. This method extracts the characters in a string between "from" and "to", not including "to" itself. toLowerCase(): The toLowerCase() method converts a string to lowercase letters. //Output will be "hello world!" toUpperCase(): The toUpperCase() method converts a string to uppercase letters. Also read "jQuery Code: Change text to Uppercase"
match(regexp): The match() method searches a string for a match against a regular expression, and returns the matches, as an Array object. //There are 3 matches with the "ain" regex in small letters. So it returns ain 3 times. replace(searchvalue, newvalue): The replace() method searches a string for a specified value, or a regular expression, and returns a new string where the specified values are replaced. 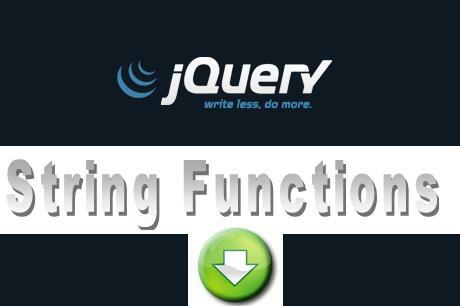 //Output will be "Visit jQuery By Example Blog!" search(searchvalue): The search() method searches a string for a specified value, or regular expression, and returns the position of the match. This method returns -1 if no match is found. slice(start, [end]): The slice() method extract parts of a string and returns the extracted parts in a new string. Use the start and end parameters to specify the part of the string you want to extract. The first character has the position 0, the second has position 1, and so on.